The Kensington Symphony Orchestra under Russell Keable opened their 2015/16 season on October 12th with an exhilarating concert at St John’s Smith Square, to a capacity audience. Starting with a bravura account of Richard Strauss’s Don Juan, and ending with Mussorgsky’s vivid Pictures at an Exhibition, the KSO boldly programmed John McCabe’s Concerto for Orchestra as the central attraction, showing up the timidity of the professional orchestras in not treating this superb work as standard repertoire. The Concerto for Orchestra was written for the London Philharmonic Orchestra in 1982, and the first performance was conducted by Sir Georg Solti, who liked the work so much that he took it to his ‘other orchestra’, the Chicago SO, where it received outstanding reviews in the Chicago press. The KSO account under Keable stood proudly beside those of Solti’s two great orchestras, and through their dedicated skills and commitment they lost little by comparison. I was delighted, and I’m certain that John would also have been delighted, by their splendid performance. The LPO/Solti World Premiere performance is available on CD in their archive series on LPO 0023. 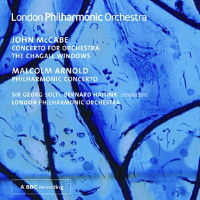 It is coupled with a magnificent performance of McCabe’s Chagall Windows, with the LPO conducted by Bernard Haitink, and the CD also includes Malcolm Arnold’s Philharmonic Concerto.